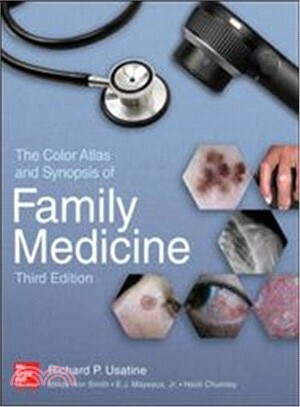 The Color Atlas and Synopsis of Family Medicine simplifies and supports visual diagnosis like no other guide. The text is bolstered by more than 2,000 illustrations, consisting of state-of-the-art photos and drawings, most in full color. Page after page, the book’s precise clinical images are integrated with evidence-based diagnostic pearls presented in bulleted text—ideal for time-pressed physicians. Sections highlight specific diseases and disorders, organized by anatomic and physiologic systems, with each chapter opening with a patient story to connect the photographs with real-life clinical scenarios. Every condition features a consistent format that includes the patient story, Epidemiology, Etiology and Pathophysiology, Diagnosis, Differential Diagnosis, and Management to aid the reader in navigating to the right section with ease and efficiency. Richard P. Usatine, MD, Professor of Family and Community Medicine, Professor of Dermatology and Medicine, Assistant Director, Medical Humanities Education, University of Texas Health Science Center at San Antonio, Medical Director, Skin Clinic, University Health System, San Antonio, TX. Mindy A. Smith, MD, Professor of Family Medicine, Michigan State University, College of Human Medicine, East Lansing, MI, Associate Editor, Family Medicine, Associate Medical Editor, FP Essentials, American Academy of Family Physicians. E.J. Mayeaux, Jr. MD, Professor of Family Medicine, Professor of Obstetrics and Gynecology, Associate Family Medicine Residency Program Director, Louisiana State University Health Sciences Center, Shreveport, LA. Heidi Chumley, MD, Associate Chair of Family Medicine, Associate Chair for Undergraduate Medical Education, Department of Family Medicine, University of Kansas School of Medicine, Kansas City, KS.